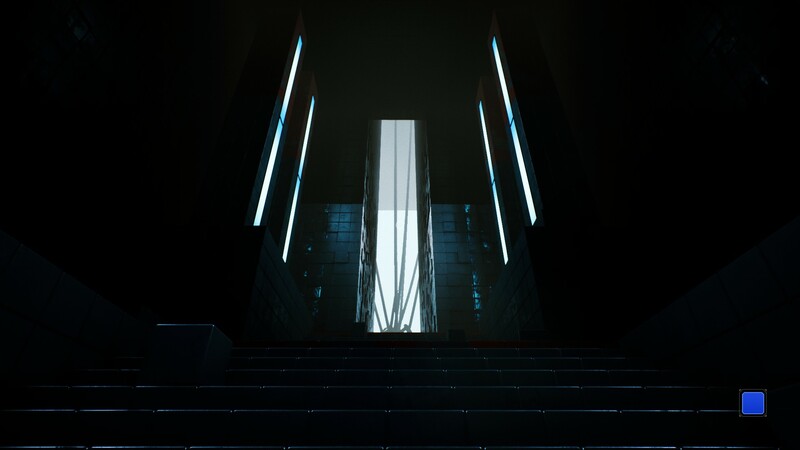 Q.U.B.E 2 is certainly the type of game I enjoy. A nice puzzle dungeon, akin to Portal, that gets your brain working. It merges story and gameplay together in similar ways. It appears to be a lot more like Portal 2 than anything else (There are going to be a lot of Portal comparisons). That’s not a bad thing, per se, it just means that someone who has played many other puzzle games, such as myself, would begin to see similarities between the two. Before you continue with this review, I recommend grabbing the game for yourself if you enjoyed the other two in the series created by Toxic Games, Q.U.B.E and Q.U.B.E: Director’s Cut, or if you enjoy puzzle games. If you’ve already played, or want to know more and aren’t afraid of spoilers, then grab a cup of tea and stick around. 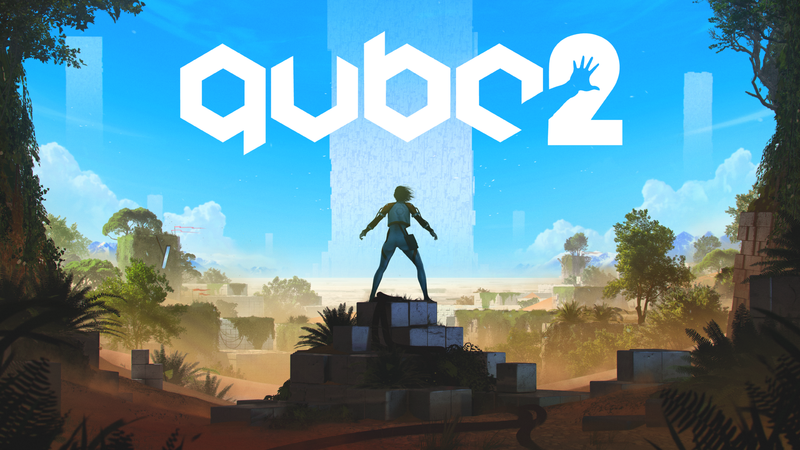 Q.U.B.E 2’s story has you in the shoes of Amelia Cross, an archaeologist. You wake up stranded on a desert planet with no idea how you got there and wearing a strange suit. You hear the voice of your husband over your headset as you call out his name and collapse in the sand storm, strange architecture in the distance. 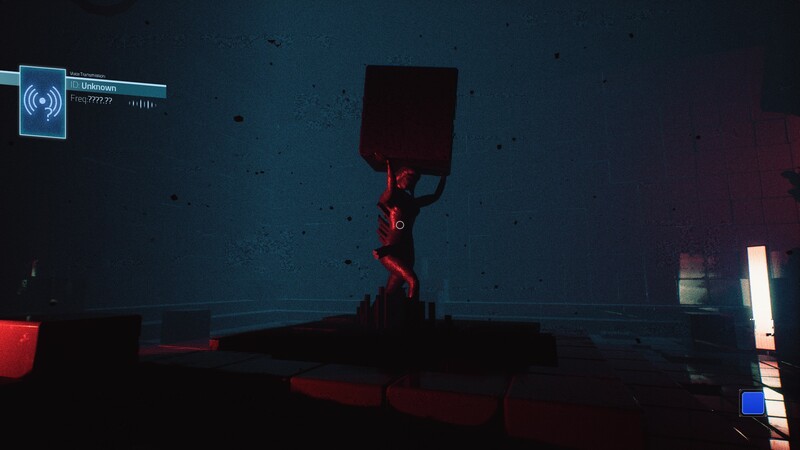 You awake in a mysterious chamber consisting of inter-connected cubes, a stranger and other survivor Emma Sutcliffe begins to guide you through the first puzzle, describing how the Manipulation Suit works. She explains that the suit was designed after the first contact with this alien structure. You move through the structure, slowly learning about it through Emma’s fascination with the technology and Amelia’s curiosity of the world she’s been placed into. It’s quite interesting and light-hearted until you reach the first of many statues. These statues are bathed in a red light and speak in broken sentences made up of clips of other peoples voices. You begin to get the idea something is wrong with the place, like it’s alive. This continues for a little bit as you and Emma try to meet up at a beacon and find other survivors. Your goal throughout the game is to meet up with Emma and escape wherever it is you’ve both been trapped. The story itself is quite interesting. It works of off established themes of mysterious alien structures, but goes about it in a very well presented, written, and acted way. The story is a strong point of this game, however it does have a slightly lackluster ending tied to it, which is a little bit of a bummer for someone who was getting quite invested. 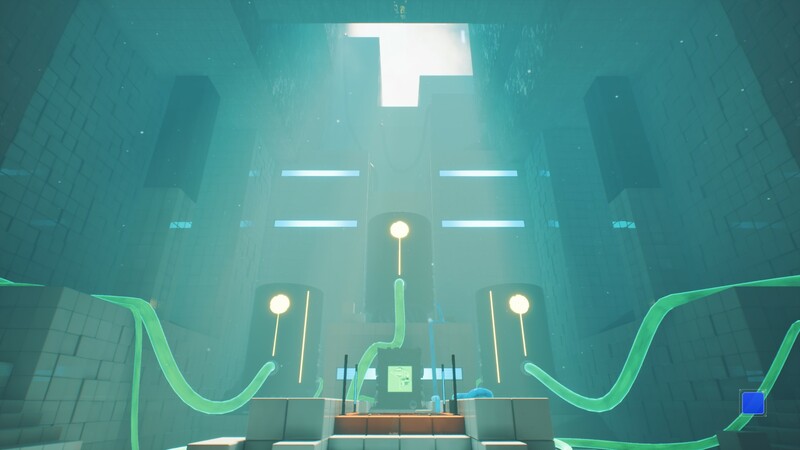 Gameplay wise Q.U.B.E 2 is incredibly similar to the previous entries and to Portal. The game starts off with you gaining the power to create blue “jump pads”. This gets used in your standard “put block on button through increasingly complex ways” style of puzzle design. The early puzzles are incredibly easy, even when the other two suit modules get introduced to you through what looks like an alternate version of Hal-9000. These modules are the “red” and “green” suit modifications that change the colour of your suits LEDs, as well as having the added benefit of creating an extendable 3 cube long bridge and the ability to spawn in a green cube. These modules are the only things you get throughout the entire game. There are also various other objects that you can interact with to help solve puzzles. These include giant fans, movable platforms, giant buttons, oil throwers, flamethrowers, and magnetic blocks. Each of these are combined together in various different ways to create the puzzles in the game. I do have a problem with the puzzle design in this game, it seems to have taken a back seat to the story, along with level design. I hope you like entering a big chamber with 4 smaller chambers coming off of it that you need to solve to progress to the next big chamber. Each of these big chambers contains a “reactor” that activates more of the structure and gives you more story. Upon entering one of these chambers you need to solve one long puzzle sequence before attempting the other 4. This is how the game will go right up until the end. The puzzles do become rather samey after a while, and I never had true “I’m stumped” and “ah ha!” moments like I have in other puzzle games. There is only so many times you can see a slight variation on “Slide this block across the ground using oil” before you start getting a little tired of it. It seems to be scared of creating truly terrifying puzzle moments by throwing many moving parts at once. The only place that comes close to this is right at the end where you use every mechanic you’ve learnt to reach the final destination. I don’t want to be seen as down-playing the puzzle design too much. There are some definite head scratchers in here for people who don’t play many puzzle games, or have trouble creating mental maps. A lot of the puzzle problems could be solved by making the puzzles more linear and not having you solve the puzzle then back-track out of the room the same way you came in. It just makes it feel less satisfying when you need to trudge all the way along a long hallway again and again. The visuals and audio in this game are spectacular. I’d expect nothing less, especially since they have a BAFTA award winning composer on their side, David Housden. The visuals and audio design go hand in hand. The visuals are crisp and well detailed, with nice little hints of what’s to come spread throughout and a very good use of shadows and lighting to intensify certain places in the story. Later in the game everything becomes overgrown, and these visuals are just stunning. They’re on par with Portal 2’s level of vegetation detail, minus the animals for story reasons. They really made use of Unreal Engine 4’s full suite of tools. Each change in scene is accompanied by some incredible sound design and music. The empty chambers that harbour the lifeless statues have an eerie ring to them. The voices distorted. The music either non-existent or a skin crawling melody. The music kicks in only when it needs to, and when it does it definitely helps to intensify the emotion of the scene. I would definitely check out the soundtrack they have available online if you enjoyed the game. The voice acting also deserves a mention. Each actor and actress conveys their lines with as much emotion as they can muster. I felt the terror, the happiness, the confusion, in each line of dialogue delivered. Q.U.B.E 2 is a game that definitely has its flaws, but considering the size of the company that made it, I can’t fault them for some. The padding of samey and sometimes drawn out puzzles, the long corridors of nothing that made me wish for a sprint button, are all minor personal gripes. If they release some more difficult puzzles, I may just pick it back up again. There’s not as much replayability as there is with other puzzle games as it is much harder to cheese the mechanics to get odd solutions. If you enjoyed the first game, or just want a short puzzle game to pass the time, I’d give it a look.